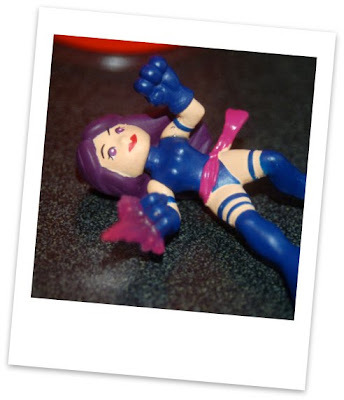 This is Psylocke. Her real name is Betsy Braddock. She is a telepath and a telekenetic, and she has some sort of power that shoots out of her hands and looks purple. Or she used to, anyway, before she lost her arm in an epic battle with the other Marvel figures and it had to be superglued back on.